Sissi uses Ulrich’s diary against him so that he will be forced to pay attention to her. The diary contains details of Ulrich’s secret activities and of the existence of Lyokô. She takes advantage of a school trip to the swimming pool to attack. But this is no time for Ulrich to get caught in a trap because X.A.N.A has taken control of the electric school bus he and the other students are travelling in. The bus, which has now become a kind of prison-on-wheels, is speeding towards the city’s chemical complex. Only the skills and daring of Odd, Yumi and Aelita on Lyokô can stop the crazy bus and save it from a deadly catastrophe. Jeremy skips the class and heads to the factory, while Yumi infiltrates Sissi’s room, hoping to recover the famous diary. 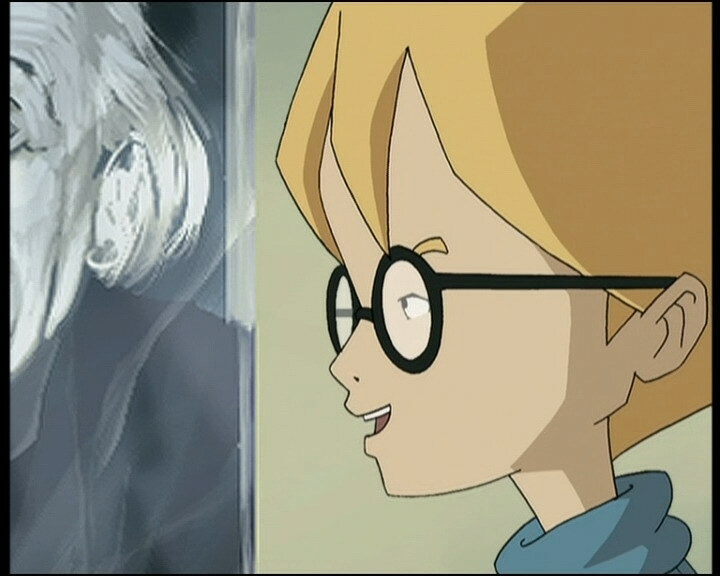 The brainiac has a conversation with Aelita, then is interrupted by Odd who warns him about the strange happenings on the bus. Jeremy launches a scan. 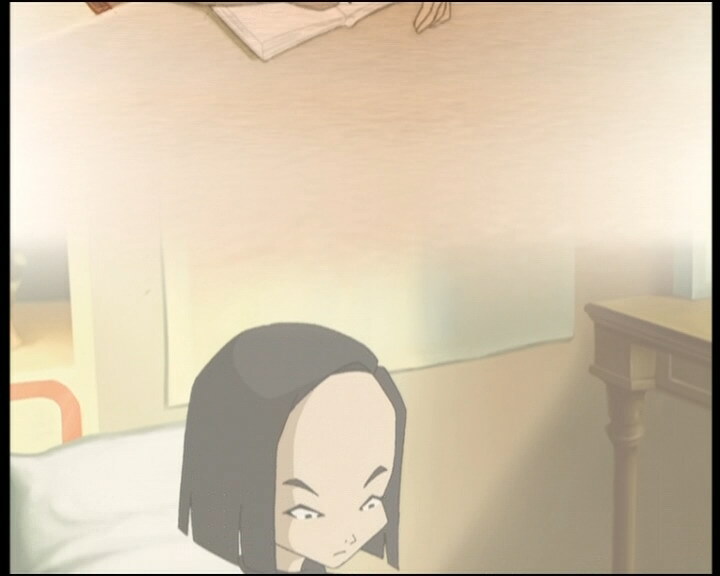 Yumi is empty-handed, but by a complete stroke of luck, she ends up finding Sissi’s diary in her room and reads several pages. 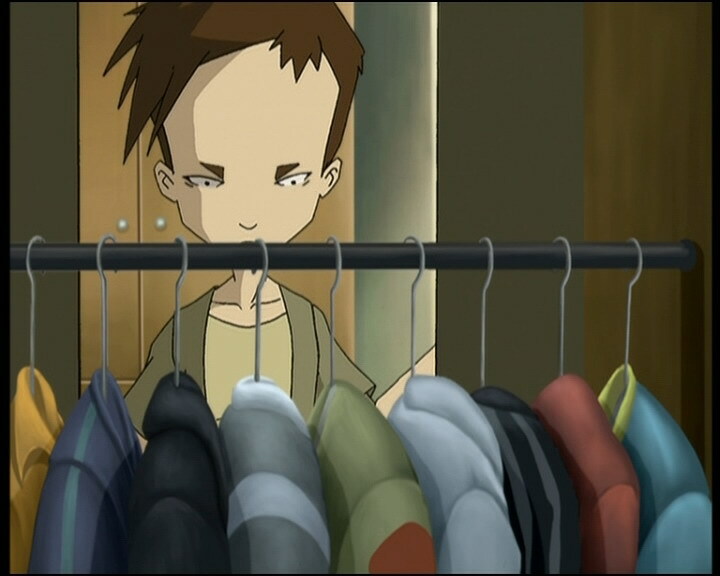 At the factory a beep is heard, on Lyoko there are pulsations; XANA is attacking! The activated tower is in the Desert Sector. On the bus everything is still calm. Sissi receives a call from Yumi, who blackmails her: her diary for Ulrich’s. Beaming, the boy thanks Yumi and sits next to Odd, leaving Sissi to fume. Suddenly, the bus driver loses control of the vehicle and the bus accelerates abruptly, which makes the engine roar. Steering wheel and gear stick moving on their own, under XANA’s control…Jeremy talks to his friends over the phone and sheds light on their situation; consulting a map, he figures out XANA’s plan: it intends to drive the bus right into the petrochemical complex! Time is running short! Odd jumps from the bus to go to the factory, and the vehicle continues its crazy course, gaining more speed every metre! Aelita and Yumi arrive on Lyoko in front of the activated tower. Without having seen any monsters, a sand tornado makes its way towards the two girls. They try to avoid it as best they can, but they’re running out of time; a Megatank has come to join the festivities. 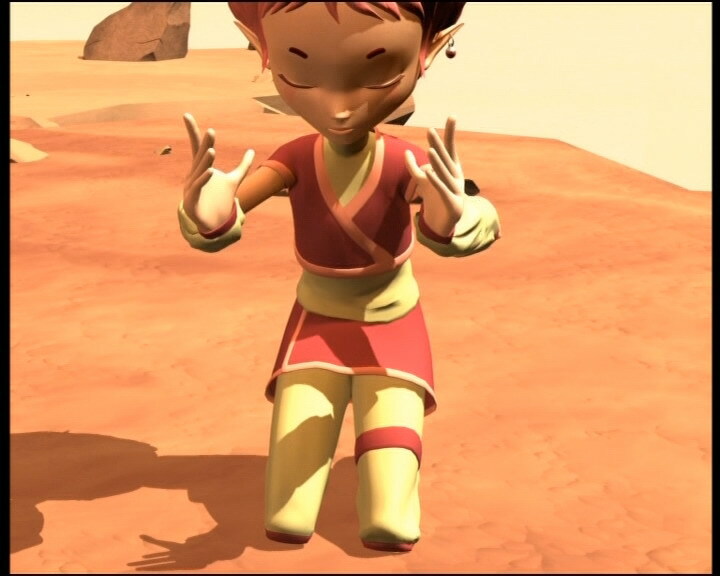 Yumi is devirtualised by the monster and XANA creates cracks in the ground, isolating Aelita. Odd arrives just in time and destroys the metal ball (by leading it into a crevasse), after Aelita had gotten back onto the mainland thanks to her power of Creativity. 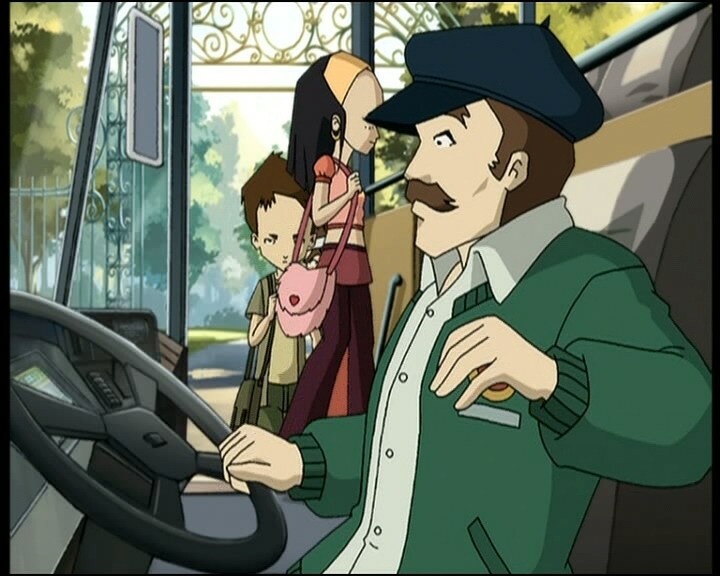 Aelita heads to the tower, as the bus heads inexorably towards the petrochemical plant. 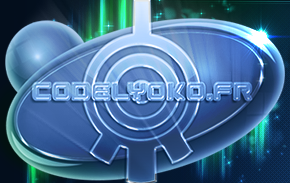 The Code Lyoko is once again entered just in time, and a Return to the Past saves them. Yumi retrieves the diary which Sissi had taken, and gives it to Ulrich, who promises that in return, one day, he’ll tell her about its contents…then he runs off, blushing. - Attack: Take control of the bus taking Kadic students to the pool and run it into the petrochemical plant. - First time a Megatank falls into the Digital Sea. - Second episode in which Sissi cries. - Herb is jealous of Ulrich. - Yumi knows how to force locks. - Odd thinks that Sissi should get a nose job. 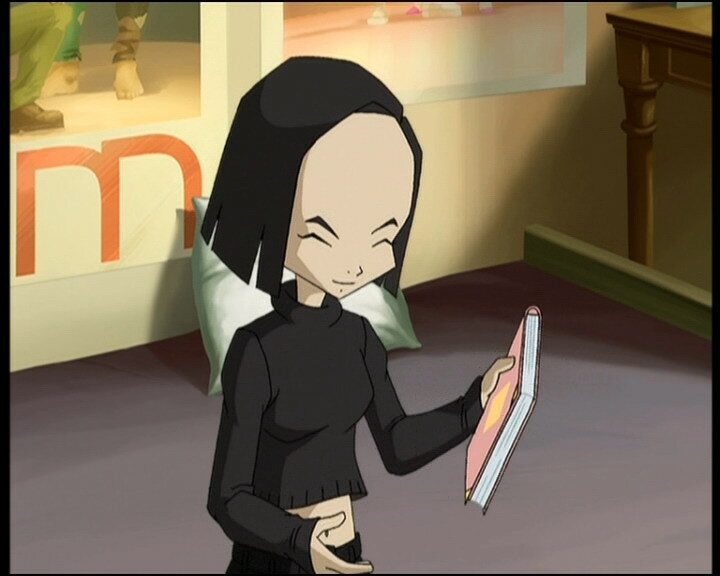 - Ulrich keeps a diary in which he writes about things such as Lyoko and his love for Yumi. - Sissi is insanely jealous of Yumi, doesn’t like Jim, is ready to do anything to go out with Ulrich, even blackmail…despite everything she apologises, proof of a good heart; she also keeps a diary. - The bus door is sometimes blue instead of white. - When Yumi arrives on Lyoko the tower’s halo disappears. - When Sissi talks about going to the cinema with Ulrich, Pierre François is no longer behind them but Heidi is. 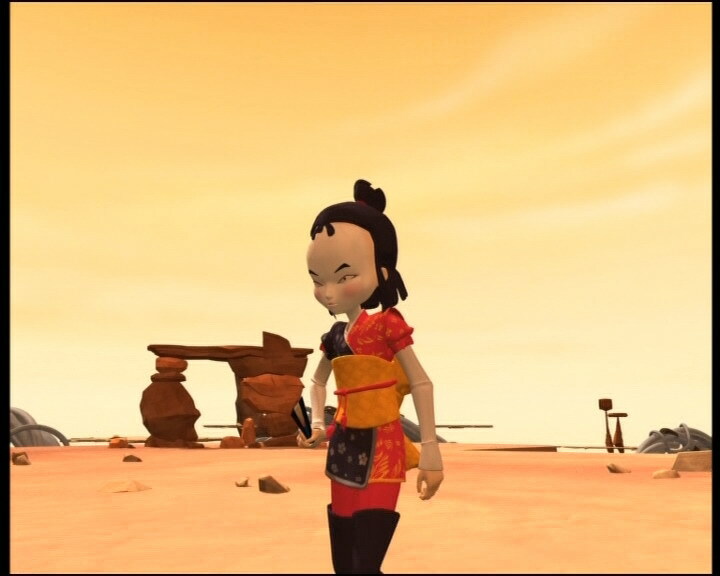 - When Yumi grabs her skateboard to get to the factory, we see Jeremy’s scooter when it should already be at the other end of the tunnel. - When the bus reaches the petrochemical plant there are only three police cars when there used to be four. - Just at the moment when the bus driver asks what’s happening, Herb isn’t beside Ulrich, but Jean-Baptitse Pujol. - Jim is shown sitting at the very back of the bus, but when it speeds up he is sitting in one of the two-seaters beside the aisle. He then appears back in the back seat. - When Odd jumps out of the bus the door is facing the traffic islands in the middle of the road, meaning the bus is driving on the wrong side of the road. He is then seen getting up off a footpath, so unless he rolled in a large arc back onto the closer footpath, they made a mistake in the background art. Similarly, the number of lanes on the road is meant to be two, but the placement of the bus makes it appear around five or so. - During Mr Fumet’s class we can see Sandra Dialo and Ninon Costes when they’re actually in year 6, as well as Pierre François and Tristan Brossard who are in year 7. - At the moment when Jeremy says “Careful, there’s a ridge,” we see that Odd and Aelita’s icons are on the other side of the plateau instead of behind the Megatank. 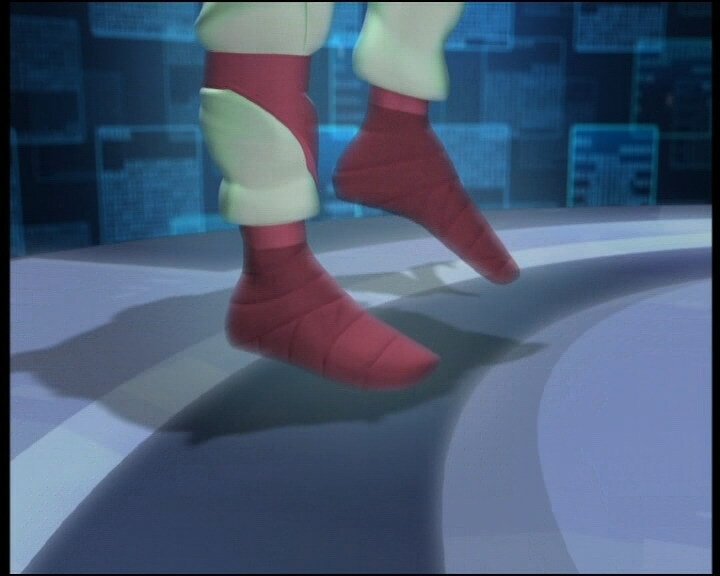 - Just before Odd catches Aelita to stop her from falling into the Digital Sea, we see an identical shot to one from the first episode, “Teddygozilla” where he runs to meet Aelita at the crater. - We notice that two students held prisoner on the crazy bus (Claire Girard and Jean-Baptiste Pujol) walk past in a later shot at Kadic when Yumi receives a call from Jeremy. Pierre François is also seen both on the bus and in Yumi’s class…unless you have the power of ubiquity, that’s impossible. - Odd’s pants are entirely the one shade of purple when Yumi walks towards him and Jeremy, when he signals to Ulrich to sit next to him, just before jumping off the bus, and before leaving the lift, and the colours are inversed just as he enters the scanner. - On the bus, just after Ulrich had spoken into Odd’s ear, Sandra Dialo is just behind Emilie when she was in front of her on the bus. - Odd’s phone number and Yumi’s are identical: 655-225-958! - First mention of the Digital Sea. - First flashback in the series (Sissi looking for Ulrich’s diary) when Yumi reads her diary. - Only episode in which there is a sandstorm in the Desert Sector. - Second of two episodes in which Odd was voiced by Christophe Caballero. - Second of three episodes in which Sissi was voiced by Christine Flowers. When Ulrich opens the drawer of his closet we see a Game & Watch Mini Classic, this keychain is one of the last official renditions of the Game & Watch games released in 1998. Ulrich: Uh…you go have breakfast, there’s something I have to find! (After rummaging around) I can’t believe this! Odd: Ah! Eight slices of toast and three bananas! Not bad, huh? Ulrich: Oh! What’s wrong? Afraid the wall’s going to crumble? Sissi: Ha! Very funny. Can we talk for a second? Yumi: Hey, look over there it’s Ulrich! Odd: But…what’s he doing with Sissi? Ulrich: Hey, that’s blackmail! Why do you expect me to give into that? Sissi: First of all because it’s hard to say no to a pretty girl like me! And second of all, I’m not going to give you any choice! Odd: Hey what’s going on with them? I’m seeing things! Ulrich and Sissi? That’s weird…on the brighter side, check out how jealous Herb is! Mr Fumet: Odd? Are you listening to me, Odd? Odd: We have some important things to talk about, Sissi! Come on, hurry up! Jeremy (to Ulrich, finally free of Sissi): Mind explaining? Sissi: The answer is no! For the last time, I did not have a nose job! So stop asking, huh?! Odd: Electric and powerful too, huh? I’ll bet you this crate goes about as fast as a snail! Jim: Go sit down, kid! 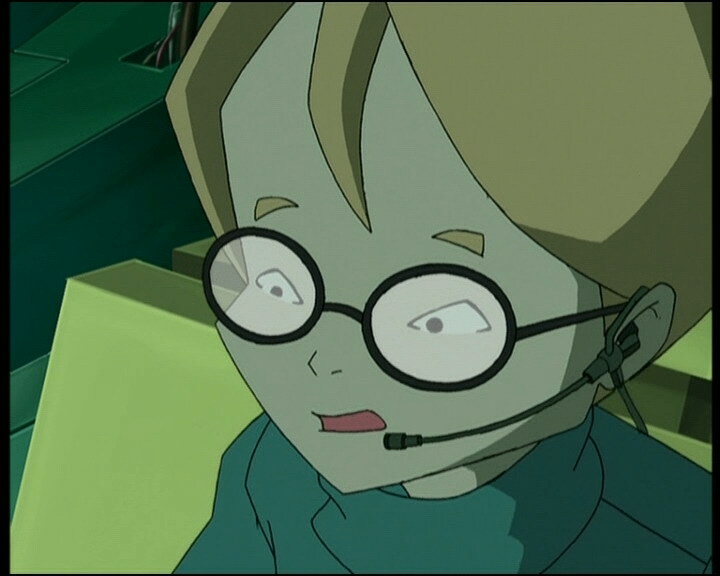 Aelita: I was waiting for you to call. In the meantime I was studying your world a little more! There are so many strange things to discover! Sissi’s diary: I’m tired of him acting like I don’t even exist, I can’t stand watching him pay so much attention to Yumi. So, while he was in the lunchroom, I went looking around. I just wanted a picture of him, but I found much better than that! Now he can’t possibly turn me down. I know what I’m doing isn’t very nice, but it’s the only way I can get him to stop ignoring me. Yumi: Of all the nasty tricks! 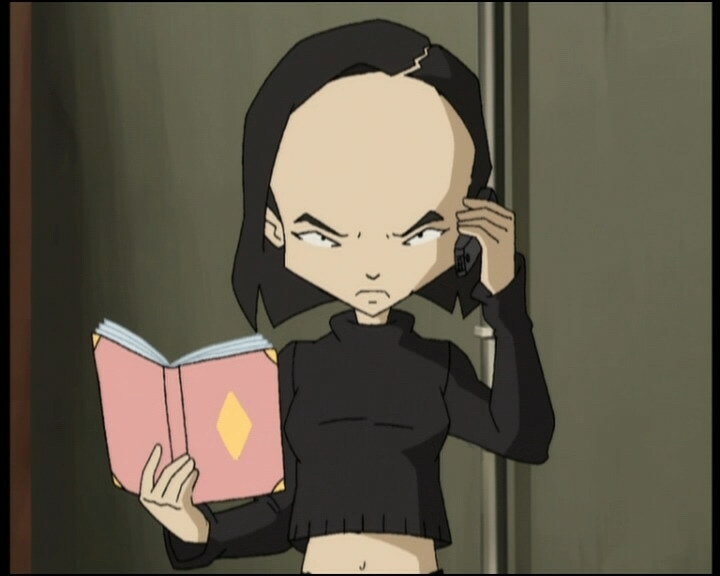 Yumi: You were right, she knows about Lyoko. She doesn’t really understand what it is, but she’s ready to use what she knows. Sissi: Hey, what if I ask my father if we can go to a movie tonight? That’d be cool, huh? Sissi: Huh?! I’m being nice to you right now, but if you keep ignoring me it just might not last, you hear?! A little friendly advice: pay attention to me or the whole school’s going to read your diary! Sissi: Hello? Oh, Yumi…what do you want? Ulrich: Thanks a lot, Yumi! There, you see? It’s good to have real friends, isn’t it? Herb: About time! I thought that guy would never get off your back! Sissi: If you know what’s good for you, shut up! Ulrich: What’s going on with this bus? Driver: That, kid, I wish I knew! All I know is it’s out of control! Ulrich: Take off your backpacks and use them as airbags! Jim: Now hurry up and get your seatbelts fastened! Driver (reassuring Herb): Come on kid, take it easy! Just calm down, huh? Does the little girl need any help? Sissi (dismissive and completely stoic): No thanks! The little girl can take care of herself! Jeremy: Ulrich! XANA is launching the bus on the petrochemical complex! Driver: Now look what you’ve done, huh?! By cutting the cable you blocked the door! Ulrich: Jim! Jeremy thinks we’re headed straight for the petrochemical plant! Jim: You mind telling me how he knows that? Ulrich: Uh…we’ll tell you that later! Sissi: Uh, Ulrich? Well I’m really sorry about your diary. It was wrong to take it. Please forgive me…can I help in any way? Odd: I have an idea, follow me! 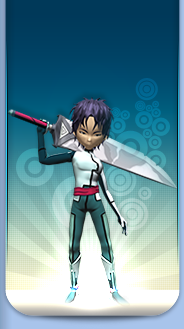 Aelita: Odd, you’re out of your mind! 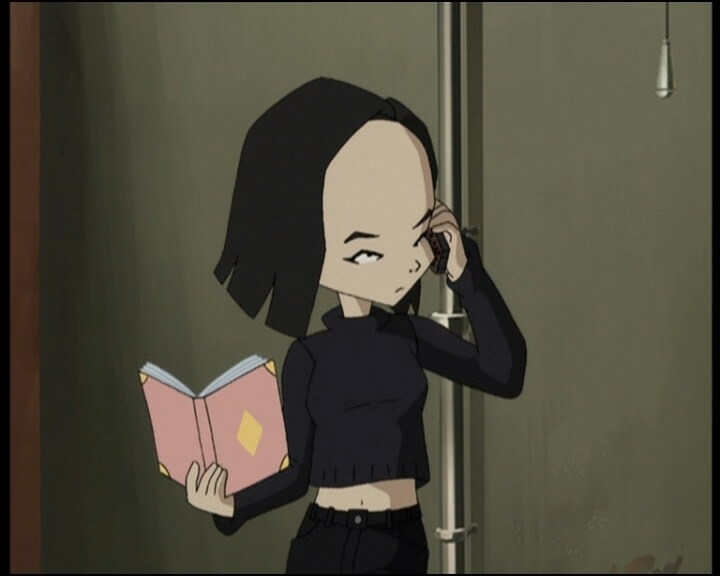 Yumi (giving the diary to Ulrich): Here, I didn’t read it. I swear, Ulrich. Ulrich: I’ll tell you about it one day, Yumi.